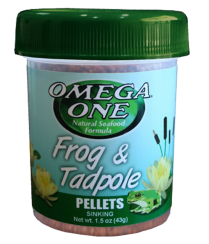 • Omega One Frog and Tadpole Pellets are 100% Made in the USA - From the ingredients to the packaging, this product is completely made in the USA. As an Omega One® retailer, you can feel proud knowing you support American economic growth. • Fresh, Sustainable Seafood - Only fresh marine proteins such as wild salmon and halibut are used in our Frog & Tadpole Pellets - no meals, hydrolysates, or protein digests.The result is a superior diet rich in natural color enhancers and Omega 3 & 6 fatty acids. Plus, we source our seafoods direct from sustainable Alaskan fisheries. • High Lipid, Low Fiber- These pellets contain an abundance of fresh, natural fats critical for amphibian growth and energy. With fewer starches and carbohydrates, they also provide the ideal low-fiber diet and promote proper digestion. • Essential Vitamins & Minerals - Formulated with the ideal levels of Vitamin A, D3, and Calcium - all critical for healthy development and the prevention of disease in amphibians. Salmon, Halibut, Wheat Flour, Rice Bran, Shrimp, Wheat Gluten, Soy Flour, Herring, Vegetable Oil, BHA (a preservative), BHT (a preservative), Ethoxyquin (a preservative), Annatto Extract, Potassium Sorbate (a preservative), Lecithin, Calcium L-Ascorbyl-2-Monophosphate (a source of Vitamin C), Vitamin A Acetate, Vitamin D3 Supplement, Vitamin E Supplement, Vitamin B12 Supplement, Riboflavin, Niacin, Inositol.